Monday November 29th 1920 It was a dark day but did not rain till evening. I got Robs dinner. The Girls went over to Mrs Pratts before noon to a meeting. I sewed a little and read some. The girls went to town after supper to a play. William not much better. 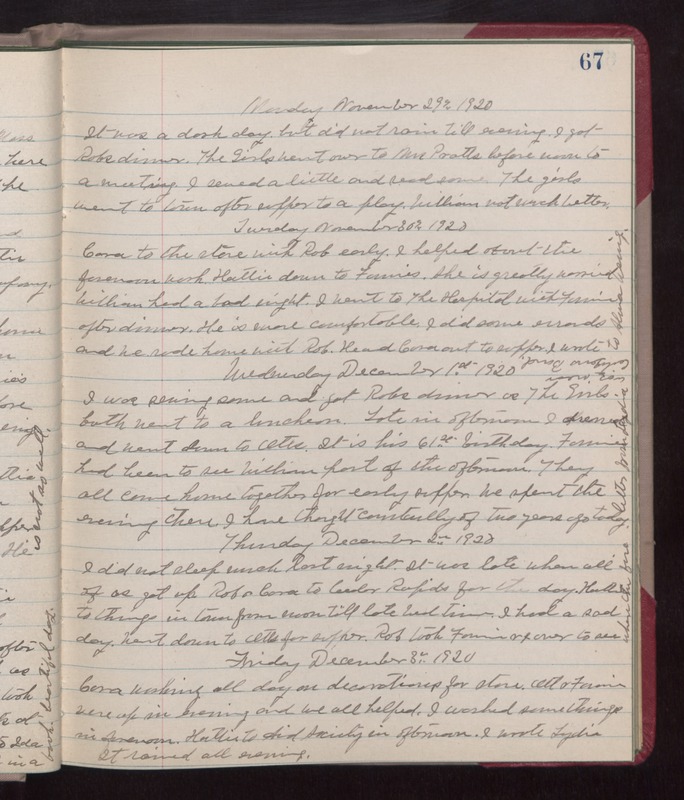 Tuesday November 30th 1920 Cora to the store with Rob early. I helped about the forenoon work. Hattie down to Fannies. She is greatly worried William had a bad night. I went to The Hospital with Fannie after dinner. He is more comfortable. I did some errands and we rode home with Rob. He and Cora out to supper. I wrote to Alma Wenig. Wednesday December 1st 1920 I was sewing some and got Robs dinner as The Girls both went to a luncheon. Late in afternoon I dressed and went down to Otts. It is his 61st birthday. Fannie had been to see William part of the afternoon. They all come home together for early supper. We spent the evening there. I have thought continually of two years ago today. Letter from Lydia. Thursday December 2nd 1920 I did not sleep much last night. It was late when all of us got up. Rob & Cora to Cedar Rapids for the day. Hattie to things in town from noon till late bed-time. I had a sad day. Went down to Otts for supper. Rob took Fannie & I over to see where the fire. Friday December 3rd 1920 Cora working all day on decorations for store. Ott & Fannie were up in evening and we all helped. I washed some things in forenoon. Hattie to Aid Society in afternoon. I wrote Lydia. It rained all evening.